“The land of Iowa is in the middle of the Middle West, and the civilization that grew there reflects that geographical fact. It is a middle ground, a Mesopotamia lying between two great rivers that drain the continent, whose settlers and citizens have quietly gone about tilling the rich black soil, laying out towns, and building churches and schools.” From Iowa, A History by Joseph F. Wall. Summertime was here and time for another adventure. My adventures tend to take the form of adventure runs. According to Jerry Schad’s Adventure Running, an adventure run is running on scenic and challenging courses, typically in wilderness or backcountry areas. Why be typical? I think an adventure run can be anywhere in which there is a sense of adventure within the essence of the run. This can be a business man taking a lunch break run in a new city of which he knows nothing. His run will be charged with new sites, sounds, odors, decisions, efforts, and wonders. He will be on an adventure run…be it a couple of miles or lasting the whole afternoon. My adventure run this past June happened to be across the state of Iowa. Heaven? No, Iowa! I had wanted to run across Iowa for a long time. Now, I had a good reason to imbed my adventure run. My son, Casey, and his wife, Dana, were having a baby daughter in late June. They lived in Iowa City. I was going to run across the state to celebrate the birth of the granddaughter. Hopefully, I would be finished before the birth. And, my oldest daughter was to have a baby in Pike County, Georgia about the same time. But, I had run the length of our state three times on different routes. Iowa would be new and an adventure. My youngest daughter, Season, was going to serve as my handler on the run. She had valuable experience handling emergencies from her U.S. Army service in Iraq. It would be her first time to help her old man on an adventure stage run. I was not disappointed. We drove to Iowa City in early June. After spending a day with Casey and family, we drove to western Iowa to camp at the Lewis and Clark State Park just west of Onawa. The next morning, early, would begin the adventure run. 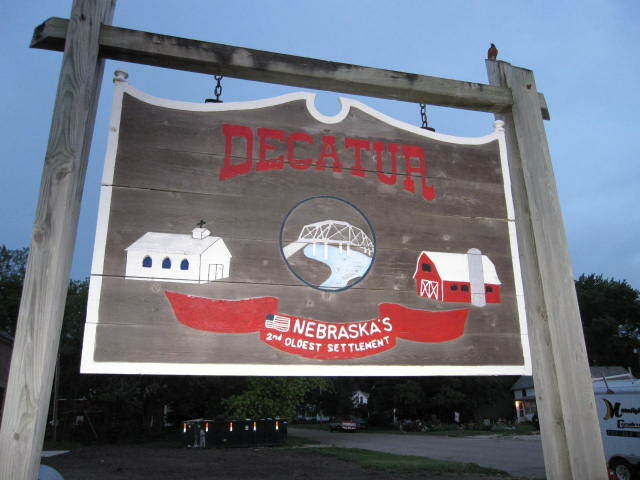 The run began in the Nebraska town of Decatur which is on the Missouri River. It was a cool morning as I ran through the town toward the narrow bridge connecting Nebraska to Iowa. It was one mile to the state line in the middle of the river. From there, it was Iowa and all it had to offer. The run started in 56° weather and climbed up to the mid to high seventies. This made for very comfortable running throughout the day. I ran on the flat road into Onawa which had the only McDonald’s that I would see until ten days into the run. Iowagave me the flats until I got to the Loess Hills which was the home of the archeological discovery, the Turin Man, in 1955. This area gave me hills to climb leaving the river delta area behind. The hills were long with gradual inclines. They were not very challenging and, in fact, gave some respite from the previous flat terrain. I ended the first day in Mapleton which happened to be one of the few towns with a store in it until day three…quite a difference from running in Georgia. My daughter and her friend, Paul, made camp on the eastern edge of town. Paul would leave on the second day after helping us get the day started. He had joined us in Iowa City. From the Loess Hills, the terrain turned to more of what I expected…long stretches of flat road that stretched out forever straight ahead. A turn in the route was a novelty. I really enjoyed running in this environment being accustomed to the convolutions of Georgia. It added to the adventure. 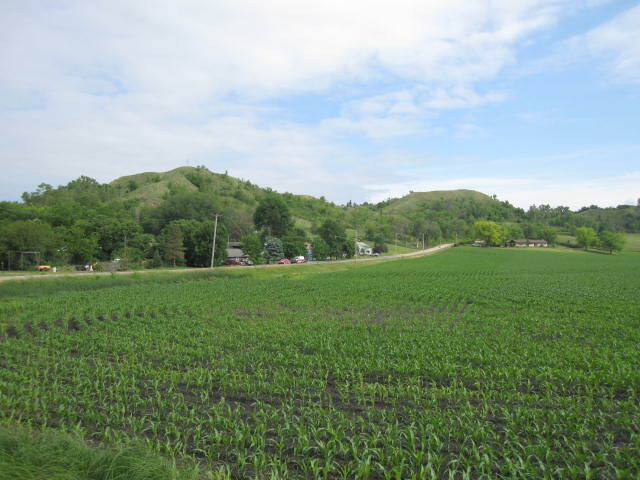 Mapleton, Schleswig, Kiron, Boyer, Carnarvon, Ulmer, Auburn, Lake City, Lanesboro, Churdan, Paton, Pilot Mound…small towns… and sunny days with clouds and a slight breeze all made for good running in the heartland. Between each town were the ubiquitous cornfields that lay on my right and left and seemingly stretched out forever. My shoes were changed each day and included Brooks Infiniti, Brooks Defyance,and Brooks Glycerin. I had Nike Strap Runner sandals in which to run if my feet became blistered or the toes hammered, but that didn’t happen. Season would drive three to five miles ahead, play with her dog, look around at Iowa, and be ready for aid when I arrived. She did a great job and made the run one of the best I’ve had. Season sometimes had to drive off course to find a town big enough to have a store so we could have supplies. We had a lot of stuff in the SUV but had to buy ice, etc. A lot of the towns were what we called “sidetowns” in that they were to our right or left of the roads on which we traveled. In Georgia, most of these same type of roads go right through the middle of the small towns. 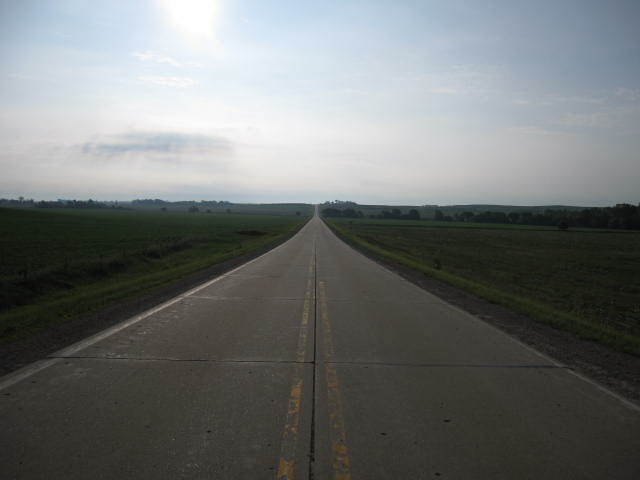 Iowa has these roads on the edges to the towns. I felt cheated in these cases because I seemed to be passing the towns instead of running through the heart of the settlement, therefore, not getting the real “feel” of the town. It did make it a real treat in those town that centered the roads. I was running thirty miles a day, sleeping in a tent in a sleeping bag at ground level. I had trouble keeping warm in the evenings after the runs. My body was still in a cooling stage, and I had to wear pants and a light jacket to keep warm in the campsite. I did have a shower each day, and that was a big plus. Iowa was superb in having a campground with facilities at or somewhere near our day’s destination. This led me up through day six. Day seven was a treat in that we had an offer to sleep in a bed on a farm. At a rest stop, two guys stopped to offer help if we were broken down. Finding out what we were doing, one offered his farm as a place to sleep for the night. It had rained the night before in camp. This Iowa family’s hospitality was a welcomed offer and promised a break from the ground. We had to backtrack to get to their farm of corn and pigs. This was the pure hospitality that I had stereotypically thought of as being characteristic of Iowa. It was good to see that it was true. I was approaching the center area of the state. The towns were a little closer together. The towns were a little larger, but still small. I had run on pavement and dirt. I had run into Vinton, a virtual large town that seemed alien to the previous ones. Upon inspection, it was still a small town. It just had stores, even had a McDonald’s…the first one in 243 miles. Ah, civilization. Nine days between cheeseburgers. I was running slower with residual fatigue ingrained in my body. Mentally, I was eager to run more and see more. My total time was now about an hour and a half longer. I had some aching in my right hip that slowed me and made starting each morning a little harder. Still, the finish was never in doubt. Approaching Shellsburg, I had the worst segment of the run. I was on a dirt road that undulated over several large hills. Added to that was heavy rain and a stiff headwind. This made running very difficult. I was soaked to the bone. Running in mud was not what I had looked to in Iowa, but here I was. But, true to the previous weather, the rain stopped…the road leveled out…the sun found me, and I was happy again. It didn’t take long to dry out in the increasing heat and sun. It felt good by being extreme to my previous condition. I was now in the eastern part of the state with three days left. Hiawatha, which is just north of Cedar Rapids, was getting near. I left the countryside behind and entered the urban environment. It was disconcerting and noisy. It was not enjoyable. The hardness of the urban driver made the running more dangerous. The bright side was that we could drive down to Iowa City and stay the night at Casey’s. This was a welcomed break in the routine. I was in a race against the birth of the granddaughter. Looking at Dana, Casey’s wife, I wasn’t sure I would win, but nature favored me, and I finished before the birth. The weather was warmer and more humid. We had some rain at times, and we took a break because it was so hard. Traffic was heavier, but that wasn’t hard to achieve. I was slowing down even more and taking more time. The hip problem was getting worse, but I could smell the finish and was confident of making it. 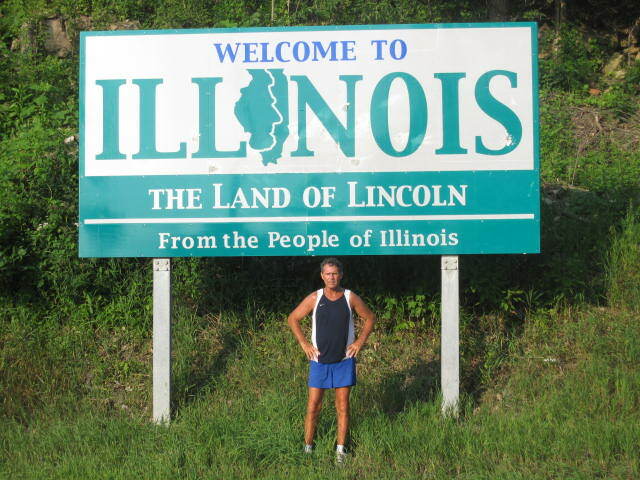 Hiawatha, Marion, Springville, Anamosa, Wyoming, Monmouth, Baldwin, Nashville, Maquoketa…towns that I had looked forward to reaching…towns that told me I was in my last two days of the run. They led me to State Road 64 from U.S. Highway 151. State Road 64 would lead me across the Mississippi River into Illinois. I was getting pumped, but it didn’t do me any good. I couldn’t run faster because of the hip pain and fatigue. Day 12, the last day. I ran into Sabula. 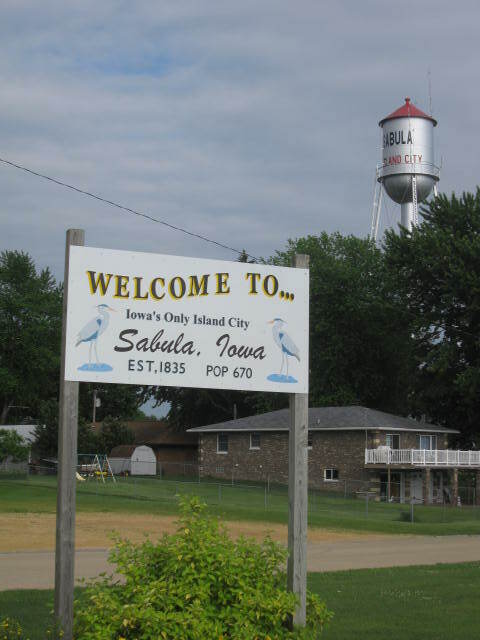 This was a town that boasted the claim of Iowa’s only island city in that it was surrounded by the Mississippi River. I ran slowly onto the island and then onto the causeway leading to the bridge across the mighty Mississippi. I was tired and hurting but happy to have completed the adventure. 358 miles completed. An adventure that I had looked forward to for a long time had been accomplished. My daughter, Season, being there to help made it even more special. The running in the heartland made my running seem even more basic than usual. It seemed like a natural thing to do to run in such a place. My thoughts during the run were laced with a great appreciation for the expanse of the USA; for the basic beauty of the countryside; for the spacious skies; for amber waves of grain; for the fruited plain. I had always thought that one of the greatest aspects of our country is the pure bigness and variety of our geography. This geography builds the great American who stands on basic values. It is a great adventure to see the country and to interact with the people. Running through that adventure makes it true to the human experience. 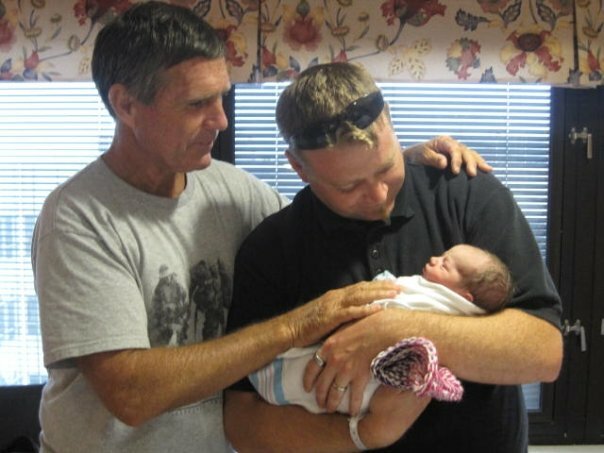 Richard with son, Casey, and new granddaughter, Sera in Iowa City Hospital. Born July 1st. 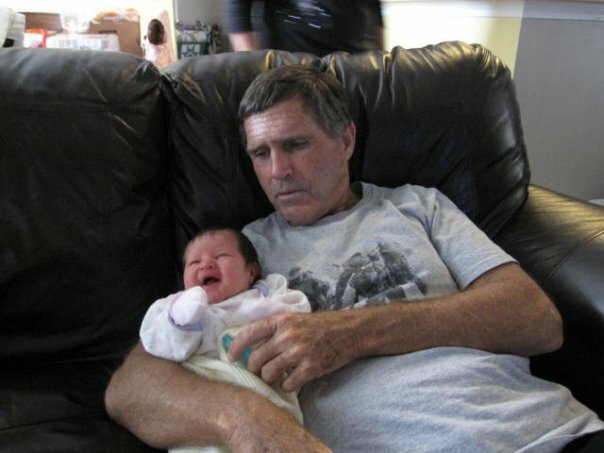 Richard with new granddaughter, Mya, back in Georgia. Born July 1st. 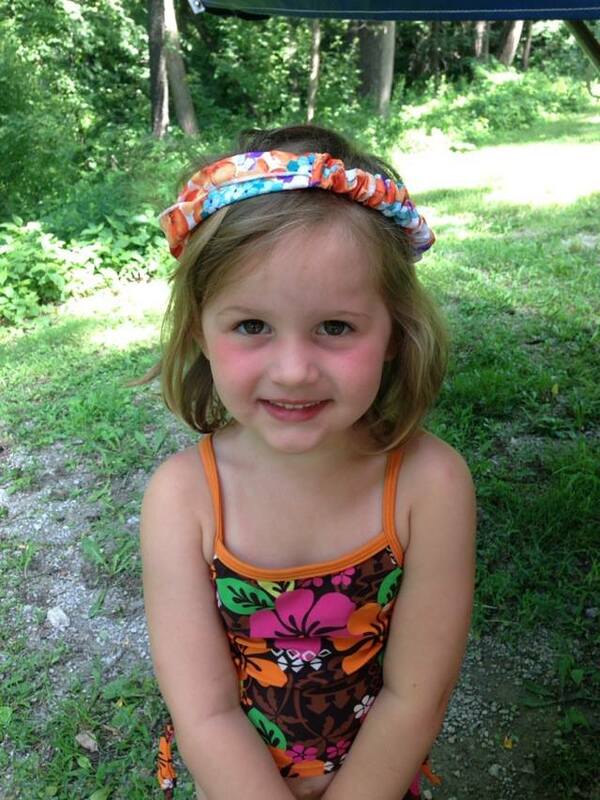 Mya Wellmaker, Richard’s granddaughter, on her 4 year birthday. 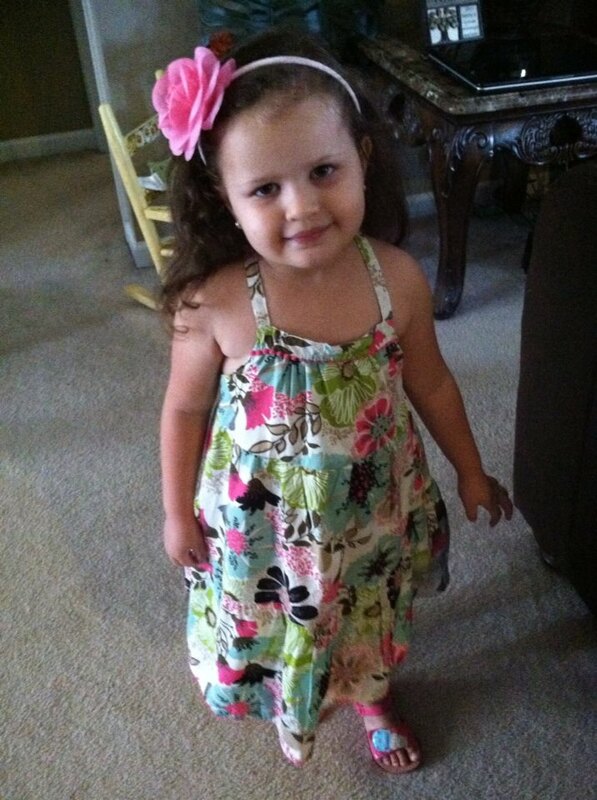 Sera Westbrook, Richard’s granddaughter, on her 4 year birthday.